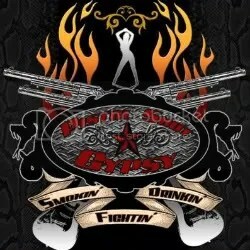 Pistol Shot Gypsy is a band based out of Rhode Island with a style of rock that is an amalgamation of blues rock, ’70s rock, ’80s rock, southern rock, metal and alternative rock. Based of the name and the album, I totally expected a southern rock/bar band sound but was surprised to hear the modern alternative influences as well. Despite the mix of styles PSG manages to break it all down into a no-frills rock ‘n’ roll sound. From the high-powered alternative rock opener “Trainwreck” and the equally compelling alternative rock of “Slave Yourself” to the bluesy classic rock of “Midnight Rider” to the rowdy barroom rocker “Troy City Blues”, the band wears many hats but wears them well and I happen to think those are the four best songs on the album. The band could easily pursue any of these directions to the fullest and come out with a collection of solid songs but it is their display of all these sounds that makes Smokin’ Drinkin’ Fightin’ so interesting. It seems a lot of young rock bands are going the route of featuring many different styles on their albums and I have absolutely no problem with this. As long as the songs are good, it shouldn’t matter and it opens the bands up to many more opportunities than they would have it they stuck to only one particular genre. Smokin’ Drinkin’ Fightin’ is a good listen through and through for fans of meat ‘n’ potatoes rock ‘n’ roll. Regardless of however you want to tag this band — that’s basically what this band plays!